In the last year or so I have been on a huge kick to reduce the number of chemicals I am using in my daily life. One of the ways I have been doing this has been to make my own cleaning supplies. 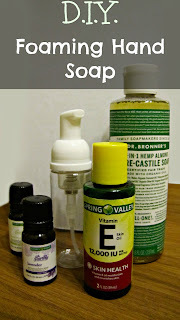 I have started to make my own laundry soap, face wash and moisturizer. But when I decided to also work on being zero waste I needed to find a good hand soap. We use a lot of hand soap at my house. My sister, who lives with me currently, is OBSESSIVE about washing her hands. I buy a few bottles of hand soap every month or so just for the bathroom. I hate how drying the soap is, especially in the winter when my hands are already dry, so I wanted to make a soap that would be better for our skin. That’s when I acquired a foam soap dispenser. My aunt had a few that she bought a while back but didn’t need them so she gave them to me. I have been using it for a month now and I won’t ever buy again. What I love about this soap is that you can easily customize it for whatever room you plan on putting it in. For the bathroom, we have a mixture of lavender and rosemary (sounds weird but I love the combo) and in the kitchen I used tea tree oil and lemon. The ingredients are easy to obtain and I always have them on hand anyway! I mix all the ingredients together in a glass jar or measuring cup then I just pour it into the bottle and voila- hand soap! 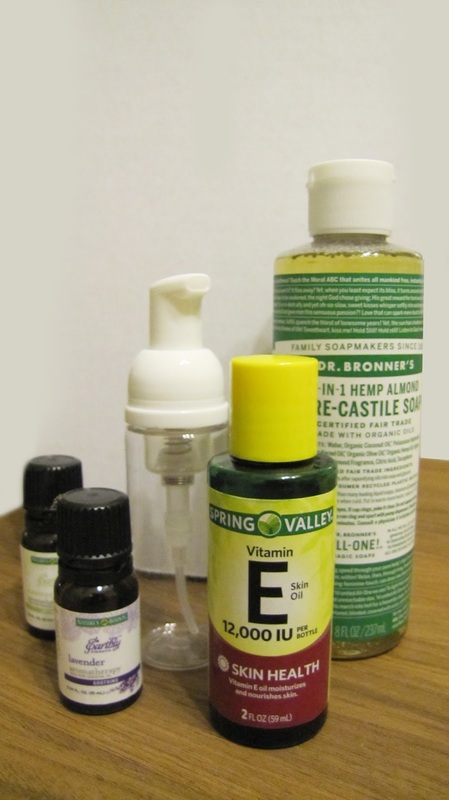 You can sub out the Vitamin E oils with another carrier oil but I had this on hand and it is really good for your skin. The most important piece is the distilled water. This will keep the soap pure and it will last longer. You can buy a jug of distilled water for cheap at the store (I keep a jug on hand just for anything like this) but you can also boil water for about 5-10 minutes and use it as soon as it cools. 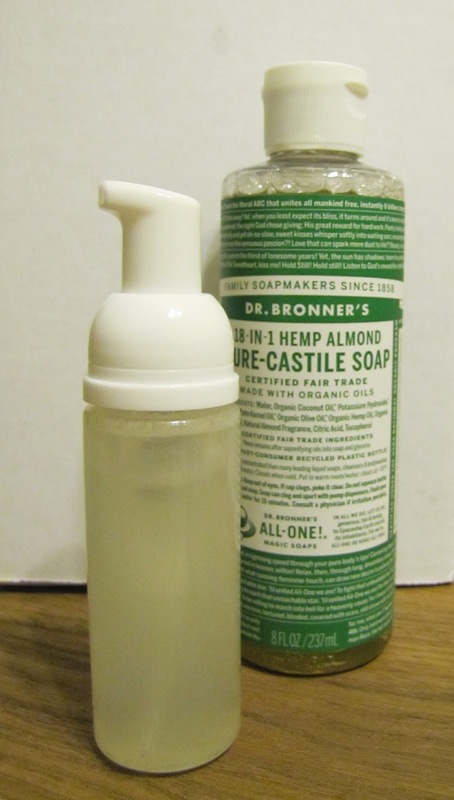 I like to use Dr. Bronner’s Castile Soap for this because I can mix and match the scents from the soap with what essential oils I plan on using. I love their tea tree, peppermint and eucalyptus scents the most. I always have this soap on hand because I use it for everything! 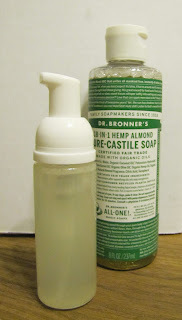 If you don’t want to use a plastic bottle to keep your soap in - hello zero wasters - you can use a mason jar! It is really easy but it might take some time. What you need to do is trace the bottom of the foamer onto the metal lid of the jar and cut it out. You can either super glue or hot glue it onto the lid and there you go! 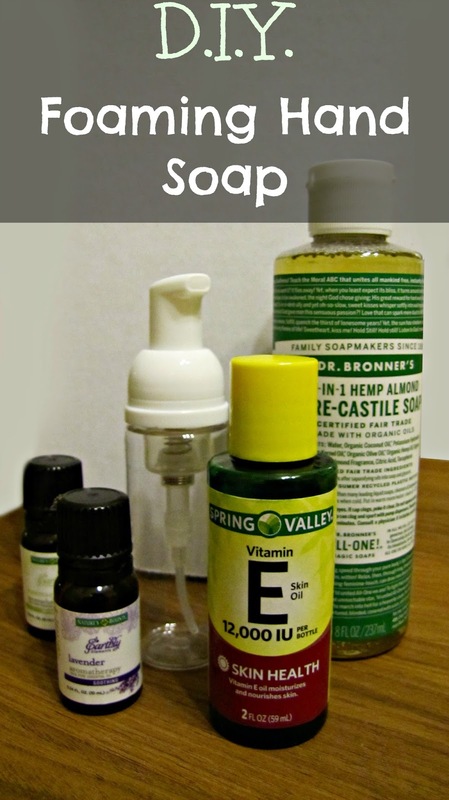 A glass soap foamer that won’t break down due to the essential oils! And it looks nicer in my opinion. I think its an innovative and reliable way to save the soap and get an easy and reliable alternative for the purpose. I hate plastic bottles so I'm gonna keep it in mason jar.